Recently, country witnessed the most unimaginable act of bravado from a sitting judge of a High Court. Recommendation for appointment of 12 judges by the collegium in the Madras High Court was questioned by Advocates and their Writ Petition was being heard by a Bench comprising of Justices V Dhanapalan and K Sasidharan. Justice Karnan, sitting judge of the same court, a man not unknown to controversies, barged into the courtroom and started making allegations in open court expressing his objections to the manner of appointment of those 12 judges. He had many other avenues to channelize his feelings, the avenues well within the four corners of judicial conduct expected from a constitutional functionary. And yet he chose this convenient option of whimsical conduct. Had been a member of subordinate judiciary, he would have been shown the door by now. No action can seemingly be taken against a sitting judge when he decides to barge into court room whilst the proceedings are in force and hurl allegations, other than transferring him to another High Court. And even this form of punishment and its form of implementation will not fail to amuse one for its absurdity. There is a general perception in the judicial community that High Court Benches of North-Eastern States are meant for accommodating such judges, which effectively demean such High Courts. Is such High Courts any inferior, or are those areas any less a part of India? These questions remain yet to be answered. Misconduct of Judges of High Court and Supreme Court is a problem with no tangible solution so far. Lawyers may boycott, the public may protest, vigilante namesake committee could be set, unrealistic impeachment proceedings may be initiated, errant judges may be transferred, and nothing beyond. We have enough provisions for disciplining the subordinate judiciary, the High Court is vested with power of superintendence. On the other hand, no disciplinary action can be taken against the judges of the Supreme Court and High Court. Let us hope that the impending the Judicial Standards and Accountability Bill, 2010 may address many areas of concern. The Constitution provides that judges of the High Courts and Supreme Court can be removed only by Parliament on the basis of a motion in either the Lok Sabha or the Rajya Sabha. The existing procedure for investigation into allegations of misbehaviour or incapacity of Supreme Court and High Court judges is given in the Judges (Inquiry) Act, 1968 The 2010 Bill replaces the Judges (Inquiry) Act, 1968 and avowed objects are (a) create enforceable standards for the conduct of judges of High Courts and the Supreme Court, (b) change the existing mechanism for investigation into allegations of misbehaviour or incapacity of judges of High Courts and the Supreme Court, (c) change the process of removal of judges, (d) enable minor disciplinary measures to be taken against judges, and (e) require the declaration of assets of judges. It is interesting to study the allegations of misconduct of members of the Constitutional Courts. Studying such instances gives an insight into faulty foundation of our judicial system. In an affidavit filed in Supreme Court by Shanti Bhushan, Senior Advocate who was the Union Law Minister in post emergency period, made a shocking allegation that 8 out 16 Chief Justices we had, were corrupt. In the light of such a revelation, there are two possibilities before the Court to salvage the prestige of Indian judiciary, either convict Shanti Bhshan or order investigation against those 8. Both are not happening in reality except a slow moving contempt proceedings. Why so ? The root of the problem lies in selection method of judges. It saddening to see that many judges of our constitutional courts behave without grace and majesty expected from them. There have been incidents of exorbitant display of rage by the judges acting in impulse against the lawyers. It has now become a common feature in Courts to see Judges and Lawyers argue in a heated atmosphere and judges use words not befitting to the seat they occupy. It is difficult to bring in such misconducts within a legislative framework and find solution. We have seen Punjab and Haryana High Court judges taking mass casual leave to protest against it’s then Chief Justice who allegedly withdrew cases from the board of judges without their notice. It may be difficult to decide here, which instance is worse, the CJI arbitrarily withdrawing cases or the judges resorting to such tactics without paying regard to the court decorum. What ultimately matters is the quality of men and women. Recently, a national daily reported habit of late sitting of a sitting Supreme Court judge. Whatever may be the reasons justifications for continued late sitting, judiciary must have a known system to govern and Court hours should not be judge centric. Most often, Rules and discipline are made by judges according to their personal choice and no one can even beg to differ with the ways of their lordships. We must have uniform court procedure. In the Apex Court, some of the Judges had imposed a Rule that ' no Passover for the first ten matters'. Though it caused great inconvenience to the lawyers, the 'obedient bar' religiously followed for the fear of displeasing their lordships. Judges remarks to arguments of a lawyer that “don't give lecture to us”, is thoroughly non-judicial and condemnable, but lawyers for professional sake condone it and move on. What is depressing is that majority of Senior Lawyers swallow such ignominy without a murmur. The press is silent in such aspects for fear of contempt power which is is exploited to bury criticism. It was only after a mass uproar that truth became an exception to the Contempt of Courts Act. There are criticisms on the exercise of contempt jurisdiction, and it is always judge centric. Contempt for one judge need not be contempt for another.So while in the case of P N Dudav v P Shiv Shankar (AIR 1988 SC 1208 at 1213), a cabinet minister was let go off even when he called the judiciary to be full of anti social elements, in the case of Mohd Zahir Khan V. Vyai Singh (AIR 1992 SC 642), a poor man was charged with contempt for calling the judiciary with the same label. And while one may be tempted to argue that it is impossible to completely dispense with discretion, it would be worthwhile to remind ourselves of the fact that judicial discretion coupled with judicial misconduct and the knowledge that one could get away with the same, would be a lethal weapon for judicial disarray. What really amounts to judicial conduct as embossed in the Oath of the judges as given in the third schedule of the constitution, or the Restatement of Values of Judicial Life, 1999’ a code of conduct adopted for the judges, by the judges or the Bangalore Principles of Judicial Conduct, 2002. Judges have to abide by the principles of natural justice, be impartial in their judgments or actions while the proceedings are going on. They cannot act upon personal idiosyncrasies, personal bias or whimsical behavior. They have to be consistent in their conduct. They have to rise above narrow considerations and not be prone to external influences or political pressures. Their act cannot prejudice the course of justice or life of any man. They have to mandatorily follow the procedure established by law. They have to be well versed and conversant with the facts of the case and permit unbiased hearing from both sides. Unending cross examinations or infinite arguments cannot form a part of the platter of a judge. A judge has to dissociate himself of all forms of social interactions with persons involved with the case. Now let us consider the real world scenario. In many instances, the judge’s kith and kin become biggest tax payers and busy practitioners during their serving period. It is a common knowledge that in every court in the country, some lawyers are more equal before some judges. Judges should realize that their proximity in some manner is being professionally encashed by a shameless lawyer. It is obviously an ugly seen to watch a designated Senior Lawyer appearing only in one particular court in many matters when he is not engaged in other courts. The Bar Council of India Rules, 1975 in Rule 6, Chapter II mandate that an advocate shall not enter appearance, act, plead or practice in any way before a court, Tribunal or Authority, if the sole or any member thereof is related to the advocate as father, grandfather, son, grand-son, uncle, brother, nephew, first cousin, husband, wife, mother, daughter, sister, aunt, niece, father-in-law, mother-in-law, son-in-law, brother-in-law daughter-in-law or sister-in-law. The law commission in its 230th report has criticized this practice of Uncle Judges. “Often we hear complaints about ‘Uncle Judges’. If a person has practised in a High Court, say, for 20-25 years and is appointed a Judge in the same High Court, overnight change is not possible. He has his colleague advocates – both senior and junior – as well as his kith and kin, who had been practising with him. Even wards of some District Judges, elevated to a High Court, are in practice in the same High Court. ..The equity demands that the justice shall not only be done but should also appear to have been done… In any case, the judges, whose kith and kin are practising in a High Court, should not be posted in the same High Court. This will eliminate “Uncle Judge”. 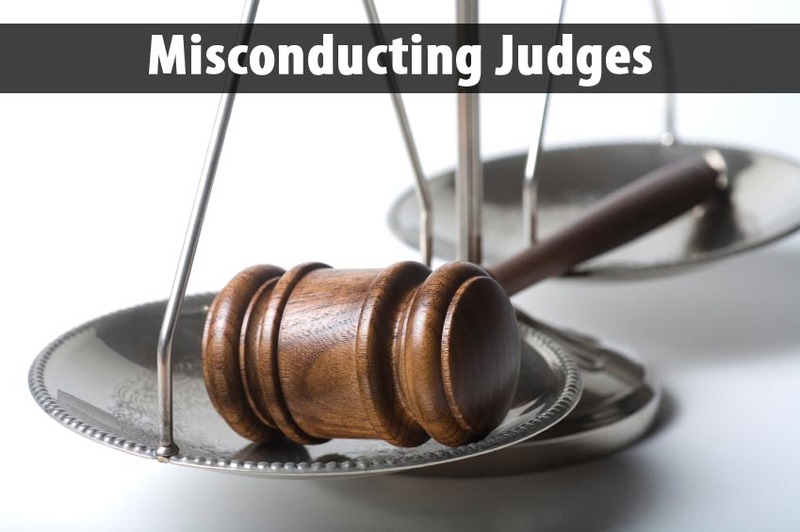 There are many undefined misconducts such as Retiring judges delivering judgments in haste or not delivering judgments at all, delay in delivering judgments etc. A new form of misconduct has born these days, thanks to the media, the Judges commenting on their own judgments post retirement. Judges after having rendered judgments become functus officio in reference to those judgments and should not come up with comments post their retirement. Justice A K Ganguly’s startling rejoinder clarifying and defending the 2G judgment after the same was critized by Lok Sabha speaker, Somnath Chatterjee, was a rather unwarranted affair, as the same could potentially interfere with the precedential value of the judgmen. We need to develop a uniform court procedure and eliminate the personality driven functioning of Judges. Our courts should be more open to public scrutiny. The video recording of court procedure is a good measure to make our judges and lawyers more accountable. We don't have the system of recording of arguments, unless judges take note of it. It is humanly not possible to remember every word and submissions in all matters and the causality is non consideration of certain points while rendering the judgment. Unlimited and unchecked judicial power, if not bestowed with the right men and women, is bound to cause mischief. Judiciary has fiercely guarded its independence. Rule of law indeed mandates the same. And yet a proper judicial mechanism for addressing the judicial complaints is consistent with the principles of judicial independence. Code of Ethics is a self regulatory tool. May be as evidenced above, it is not a sufficient check. They often say “What cannot be cured must be endured”. It is hard to do that when it relates to important tenets of civil society like Rule of Law and the Sanctity of Justice. Thus it is time that there is someone who could judge these erring and despotic Judges. In the words of Justice M N Venkatachaliah “Sunlight is the best defense”.